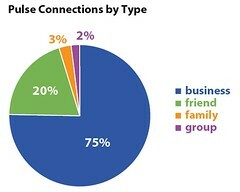 Recent announcements from Plaxo and Facebook speak to a trend toward improving the quality of the “social graph.” Plaxo revealed what happens when users have a choice of family, friend, or business as categories for relationships, rather than being forced to declare all connections as “friends.” (See charts below.) Facebook implemented more granular privacy and sharing controls. Why the move toward quality? Because the data portability drum is beating louder. Soon friends lists will become portable, which means that each user will be able to take their local piece of the social graph with them to other sites. And when a friends list becomes useful across many sites, there begins to be a reason to invest in it. 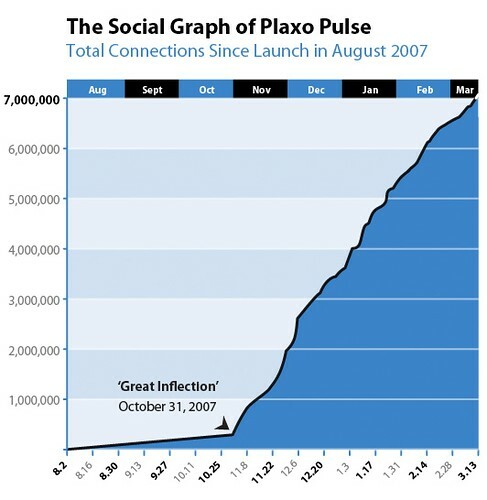 When Plaxo launched Pulse last August, it broke with tradition and introduced the first relationship categorization system for a social network. That put friction into the system, and was therefore a bit of risk. What if people weren’t willing to take the time? Based on the chart below, it looks like the gamble paid off! Chris Messina just did a post on this topic, too, though from a more technical perspective, thinking through whether and how we can better model real-world relationships via things like XFN. Huh, interesting stuff…! That was indeed quite an inflection point — any other factors that contributed to that rise, would you say? Hey, Chris. It was almost a perfect storm. The Google news story broke unexpectedly early, and we jumped in fast to be a big part of the early conversation. A huge wave, driven by PR, came over to our site, seeing it for the forst time. We’re a social application, so the surge primed the pump. In addition, we had just fixed a bunch of things in the new user flows that we honestly a bit half-baked prior to that. The combination of those factors launched the service in a new high-growth direction. It will be interesting to see what happens when we actually roll out support for OpenSocial apps! It seems to me a no-brainer that over the next 24 months there will be more demand -especially in geekdom- for the major social networks to take interconnection seriously. With-in three years I predict the age of the walled-garden social network will be dead. Certainly niche or vertical social networks will survive – but it will be in their interest to support the likes of Googles Social Graph API (or a-another) because they will always be in the minority compared to the larger Social Software brands. Rummble’s intention is to continue to build out our algorithm IP to become a discovery tool for content within these interconnected social networks, which a useful level of trust and personalisation. Users are already experiencing friend-fatigue; close on the heels of that over-sized friends list is content overload. Rummble provides a way to solve that.